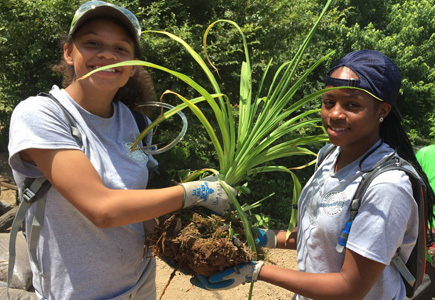 Hayle and Imani, two of Lookout Mountain Conservancy’s Leadership Interns, had a chance to give an address at the National Invasive Species Conference, in Nashville. 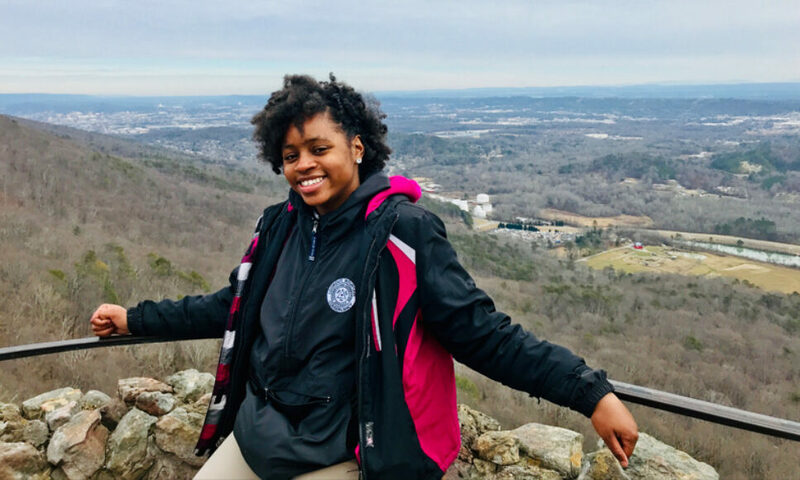 Hayle, a senior at The Howard School in Chattanooga, talked about what the Mountain has taught her, which we share with you now. We come to Lookout Mountain Conservancy bearing every burden the world has placed on us with nothing but a tool and a dream. Entrusting each other and the LMC staff, we come with an open mind and welcoming with a desire for the invasives to be removed. skills we adopt are time management, communication, precision, concentration, endurance, resilience, team work, and patience. One of the biggest projects we worked on was to get rid of the Kudzu, an invasive species. It was a tough enemy to face, and with every cut and tarp pile, it seemed to only grow more. We spent months clearing it out, yet we still had to keep coming back. It seemed like a problem you keep attempting but can’t quite get the job done. I couldn’t tell you how many times we wanted to give up. Yet we kept going for some reason. It was like finishing the project was our beacon of hope, and we wanted to preserve that light; wanting to offer a solution instead of giving up like most people have on us. Together, we clung to the dream of finishing something that we started, just to look back and see the beauty we created. The Kudzu was no match for us: we were determined to knock it out. Yet our work also involved growing things, not just ripping out plants. I really enjoyed planting the daylilies. With a look of excellence and grace these plants had more fight then they appeared. With the loss of one root ball of stem meant the end. I could see myself and others in the flowers: fragile, beautiful and delicate to the touch. Yet with proper care and persistence, we knew they would grow strong and beautiful like us. The planting was a beginning, after they were planted we still had to monitor and take care of them so they could last for a long time. That act of caring reminded me of the care LMC has given us. Like the care we provide to these plants, LMC has stood by us, keeping their promise to always look out for us. Up on the Mountain there are boulders that we are working to turn into a bouldering park. A lot of these boulders need the landing area to be adjusted so that it would be flat and safer for the climbers. To do this, we had to build stone walls to hold in the bricks, dirt and gravel that we use to level out the area. One of the things that has really stuck with me is the foundation of these walls and surrounding trail systems. With each wall or trail project their foundation meant the success and failure of everything. No amount of time spent on perfection could save our work if the foundation wasn’t stable. Working on these tasks, we became skilled in seeing the whole picture and realized the importance of a good foundation. I relate this experience to life and how we’re so quick to rush and do everything right, but if you don’t work on putting the pieces together and being right internally it could all come crashing down. LMC has become part of our foundation, our heart and support system. With LMC and Howard Interns, you might never imagine it to be a successful match. With the outside world looking to tear us down as high school students, LMC is the stability we all need. It is more than a job. It is a chance to show the world that we are important. Everything we do matters. Over the years there was not a project or stormy day that could break our timeless bond. Like the daylilies and those stone walls, there have been challenging times. But caring for our foundation and helping us grow has made a difference. I want to thank LMC for not only showing us a different part of the world but helping us find ourselves. **This speech was lightly edited for clarity.